We publish a number of leaflets for patients and the public. Our information leaflets What to expect from your osteopath and Standards of osteopathic care can be purchased, or downloaded below. 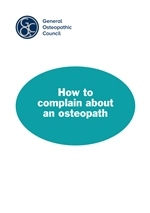 We have leaflets to help people wanting to make a complaint about an osteopath, about the General Osteopathic Council as an organisation or about a member of the GOsC Council or Committees (the governance structure). 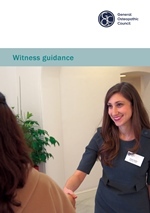 Our Witness guidance leaflet explains what happens before, during and after a hearing, to help witnesses to give their best evidence. Also available below is a leaflet about all the UK Health Regulators, explaining how to contact each one. Our public information leaflets are available to download in Welsh. Gallwch lawrlwytho fersiynau Cymraeg o’n taflenni gwybodaeth. We also produce a handy checklist in English and Welsh, aimed at osteopaths, of all our information for the public in Welsh and the materials available to help osteopaths promote their registration that are also produced in Welsh. To download a leaflet, click on the image. Our information leaflets are available to download (click on the image) and to purchase. The cost is £2.50 for 25 copies plus postage and packing. To order these leaflets, if you are in the UK, complete and return this order form, call us on 020 7357 6655 x242 or email info@osteopathy.org.uk. Postage and packing is £4.42 per 25 copies in Europe, and £7.33 in the rest of the world. To order these leaflets if you live outside the UK, email Sonia van Heerden on info@osteopathy.org.uk - please include your name, registration number, quantity of leaflets and the address you would like the leaflets posted to. We will include your invoice with your order. This leaflet is aimed at patients who are considering osteopathy for the first time. The information provided reflects the many questions we receive daily from patients and the public seeking reassurance on what to expect during the first and subsequent appointments with an osteopath. 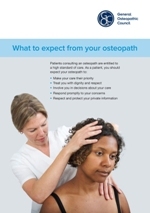 This leaflet aims to help the public learn about the high standards of training, professional skills and behavior that are the hallmarks of an osteopath registered in the UK. This leaflet responds to the assurances typically sought by other healthcare professionals, notably GPs and NHS commissioners. If you decide you want to make a formal complaint against an osteopath, we will need as much information as possible about your allegations. You can discuss this over the phone with us on 020 7357 6655 x224 during office hours, or email us at: regulation@osteopathy.org.uk, but we will also need your complaint in writing. We will ask you to fill in our Complaints Form. This leaflet provides further information. If you are not happy with the service we have provided, we would encourage you, wherever possible, to raise concerns directly with the member of staff you have been dealing with, or their manager. If this seems inappropriate, or if it is impossible to reach a resolution, there is a formal complaints procedure set out in this leaflet. There is also a complaint form that you can download, print out and post to us when completed. The governance structure includes Council and committee members. The complaints procedure is set out in this leaflet. You might also wish to refer to our Council Code of Conduct. If you wish to make a formal complaint, you will need to fill in a complaint form which you can print out and post to us when completed. This leaflet explains what happens before, during and after a hearing, to help witnesses to give their best evidence. Mae'r daflen hon ar gael yn Gymraeg. 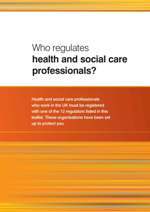 Who regulates health and social care professionals? The 13 UK health and social care regulators have jointly published a patient information leaflet, Who regulates health and social care professionals? explaining who they are and what they do. This leaflet is also available in Welsh.